“Give me your simplest fish”. I chirped nervously as I rolled onto the leather couch. In a narrow Cusco street I’d decided to get my first, and incidentally, my only tattoo. The poor Peruvian tattoo artist who had to deal with my cursing and it’s fair to say, the very opposite of a British stiff upper lip, was oblivious to the story this tiny bit of ink would eventually tell. The week had started in a more wholesome atmosphere: a wonderful hike through the snow capped Andes, stopping frequently to admire Inca ruins and eventually arriving at Machu Picchu. The weather had been kind, and despite four days without a proper wash and a few aches, I was feeling motivated to continue my journey south into Bolivia the following week. Before heading to Peru’s border, I was staying in the ancient city of Cusco. Having all the mod cons of hot running water and electricity, as well as history and culture galore, it was the perfect base. A friend and I had already indulged in a post-trek massage, been white water rafting (the consequences of which will unfold in due course) and were looking for something else to entertain our young and inquisitive minds. Talk of tattoos had begun a few weeks before as nothing more than a passing gag, but was starting to take hold as a serious consideration. How did I end up with a fish? This explanation requires a trip further back in time to firstly, my college days and secondly, a few weeks previously to Peru’s famous Nazca Lines. Before my globetrotting days, I was ashamedly content for my world to revolve around the confines of my university campus, lectures, sport and…beers. My nickname became Fish. Evidently my decision to embark on a traverse of South America was a step towards growing up, and the tie of my endearing ‘title’ was gradually fading. 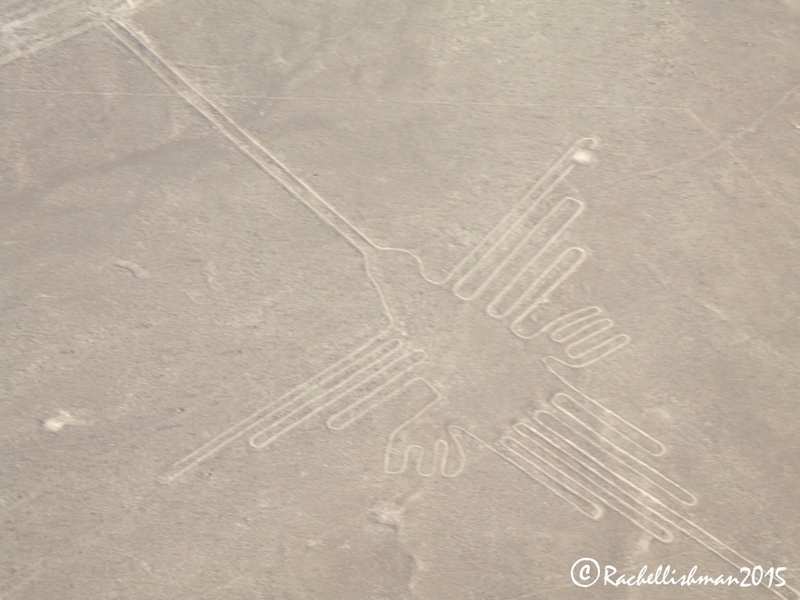 My flight over Nazca’s desert was a highlight of my time in Peru. I lucked out with the front seat of a tiny plane and as our pilot dipped and weaved over the sands, strange formations came into view. There are many theories about how these lines materialized, some more far fetched than others. They’ve been alien landing strips, natural geological phenomena and the remains of ancient civilsations that worshiped the sun, moon and stars. I was in awe of the different shapes depicted: A giant spider, a mountainside monkey and the beautiful spindly hummingbird. I decided that, hypothetically, if I were to get a tattoo, it would depict the dainty Nazca hummingbird. The seed was sown. The poor tattoo artist had seen it all before, including my potty mouth! I fidgeted in the windowless waiting room flicking through catalogues of popular designs. I hadn’t had time to sketch the hummingbird. Neither had I accounted, at any point, for my fear of needles and embarrassingly low pain threshold. I requested the hummingbird and discovered that it would take a long time due to the intricate lines (understandable given the beauty of the real thing). I looked to my friend who suggested I opt for something smaller. Great idea! I could get a tiny fish instead. I pointed at a lovely ornate specimen in the brochure. It would be very painful filling in, the bearded artist warned: at least an hour. Then, I panicked. Strangely, given the youthful idiocy of my actions, I wouldn’t warn against getting a tattoo. The fish that I now carry around with me doesn’t remind me of the frivolous antics of my late teens, but instead of a trip of a lifetime through a continent that changed the way I perceived my little world. The journey also sparked a passion for travel, without which, I wouldn’t be writing this today. That being said, one day might just edit my infamous marine bumper sticker into the graceful Nazca Lines Hummingbird!